This is an entry in a series of guest blog posts in which members share teaching strategies and reflect on classroom experiences. In the following post, Kevin DeLapp of Converse College shares his experiences using chinoiserie to prepare students for approaching Chinese philosophy. Find all of the posts in this series under the category In the Classroom. When I teach classical Chinese philosophy, one of the pedagogical hurdles I encounter early in the semester is the fact that students often harbor a variety of assumptions which shade their first encounters with the primary sources. Many of these assumptions are recognizably “Orientalist”, in the sense popularized and critiqued by Edward Said. It’s typically not the case that students are intentionally antagonistic toward classical China. They’re there voluntarily (it’s an elective course) and are genuinely excited to learn about the subject. But many of the assumptions they bring to the primary sources are drawn from random popular and contemporary depictions of ancient China. (And, at least at my institution, this course might be their one and only class on anything having to do with China, so there are few other mechanisms I can rely on to mitigate against such assumptions.) For this reason, initial interpretive efforts can easily slide into what Martha Nussbaum has dubbed the two “descriptive vices” of studying foreign cultures: chauvinism, which can play out in terms of viewing the Chinese material as primitive and pre-philosophical; and romanticism, a generally more receptive stance, but one that nevertheless projects upon the material a condescending innocence and exoticism. How to confront these biases? Starting the class off by moralizing about Orientalism tends to be confrontational and alienating. And having them read a bunch of hermeneutic theory (such as Said or Nussbaum) is intimidating and diverts precious time from an already crowded syllabus. Instead, as a more engaging way of foregrounding these questions of cross-cultural interpretation, I’ve turned to artworks from Europe’s early modern encounter with China—a genre that certainly had its own share of chauvinism and romanticism. The orientalist biases evident in these artworks tend to strike students as obvious in a pedagogically useful way: once they recognize the cultural distortions at work in the art, they can better recognize and avoid their own hermeneutic pitfalls. In this way, the use of such artworks exercise helps instantiate Confucius’s advice to learn even from poor examples: “When walking with two other people, I will always find a teacher among them. I focus on those who are good and seek to emulate them, and focus on those who are bad in order to be reminded of what needs to be changed in myself” (Analects 7.22). Toward this end, within the first week or two of the term, I devote part of a class period to showing them several different representatives of chinoiserie—a movement that swept the arts and fashions of seventeenth and eighteenth century Europe, and aimed at imitating what its European practitioners took to be “Chinese” aesthetics (“chinoiserie” is just French for “Chinese-y”). Much of this genre is innocent, even playful. (That’s another pedagogical advantage of the exercise: it’s visually fun and interactive.) The overwhelming majority of Europeans had very little direct knowledge of China, and so it became a convenient entity upon which to foist fantasias and idylls. Chinoiserie appealed to rich Europeans’ desire to present themselves as worldly, curious, and esoteric. At the same time, by monetizing and aestheticizing stereotypes about another culture, these artworks conditioned a damaging hermeneutic in which contemporary American students can still find themselves derivatively in the grip. 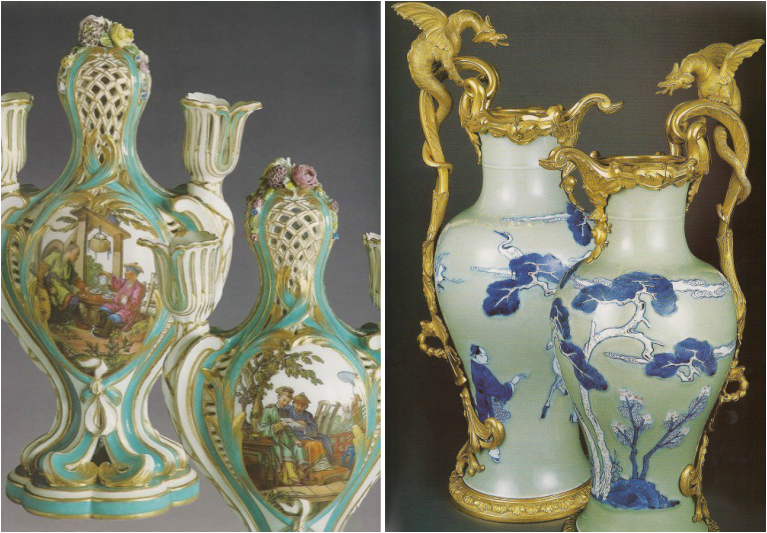 As an example, I have my class consider a variety of chinoiserie images such as these two vases, which decorated the rooms of Madame de Pompadour, mistress to Louis XV, at Versailles. ​​The vases were designed by the French porcelain company Sèvres in the mid-1760s and are representative of the European craze for anything “oriental”. Authentic Chinese porcelain was exceedingly rare in Europe, and to keep up with the Joneses, aspirant bourgeois turned to cheaper knock-offs from the Netherlands, particularly those with the distinctive blue coloration from the city of Delft. What adjectives would you use to describe each image? What or who is represented as Chinese, and what factors or appearances are responsible for this representation? If these images were your only source of information concerning what China was like or what it meant to be Chinese, what would you conclude? Students usually generate descriptions such as serene, peaceful, and relaxing. There is perceived to be a delicacy and fragility that students associate as feminine (even though there are no images of women). “Naturalness” is another apparent motif, expressed by out-of-doors settings and rustic, agricultural, and floral scenes. The students read the “Chinese-ness” of the imagery through the hairstyles, the pagoda, the cart, and the conical hats. The apparent take-home message—the “argument” that these decorative pieces would seem to be making—is that China is a charmingly simple and underdeveloped place whose effeminacy and pristineness is both an invitation to colonially-minded Europeans and a way of reinforcing European self-conceptions of being, by comparison, industrial, manly, and progressive. 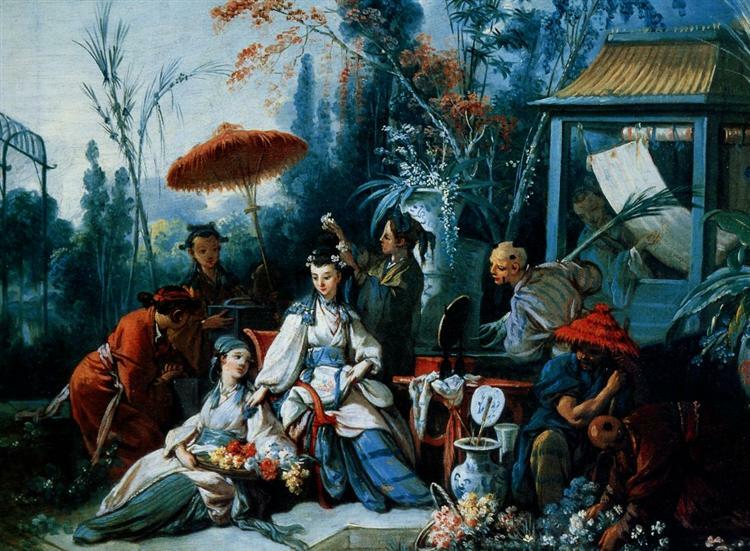 The students reflect on the same questions in reference to The Chinese Garden (1742) by François Boucher. The image depicts a scene of lounging tranquility—what Europeans of the time called, as a term of praise not abuse, a folly, i.e. a pleasant break from life’s ordeals. As above, themes of naturalness and delicacy are evident, and the same semiotics of hairstyle, clothing, fans, unfurled scrolls, and vases communicate the Chinese-ness of the scene. Students also quickly pick up on the fact that the central characters are lighter-skinned and feminine, and that the other darker-skinned peripheral figures seem to be attending to them. Boucher’s China was a fantastical vacation destination where innocent natives were eager to wait upon the whims of white tourists. As a class, we reflect on ways in which similar stereotypes about China are still prevalent. The message can be brought home poignantly by having students also reflect on stereotypes they’ve encountered about their own culture. For example, the majority of my students are from the American South and respond with both bemusement and irritation to the ways in which Southern-ness (the accent, the customs, the socio-politics, etc.) is stereotypically depicted in national and popular media. There are obviously additional ways to bring visual material into comparative philosophy curricula, viz. showing contemporaneous artworks from the source culture itself. This hermeneutic activity, however, is a fun and engaging way to preface the study of classical Chinese philosophy with concrete warnings about the dangers of cultural distortion, even when it is well intentioned and “artful”. When we move on to the actual primary sources themselves, we might not thereby be totally bias-free; but at least we have learned from the history of chinoiserie, as Confucius urges us to do from all poor examples, how incautious interpretation can say more about the interpreter than the interpreted. See Said’s Orientalism (1978). Vintage Books. See Nussbaum’s Cultivating Humanity (1997). Cambridge: Harvard University Press, pp. 113-147. I just got back from a great summer teaching workshop sponsored by the Wabash Center for Teaching and Learning in Theology and Religion, and I want to let the STCP community know about resources that the Wabash Center offers. 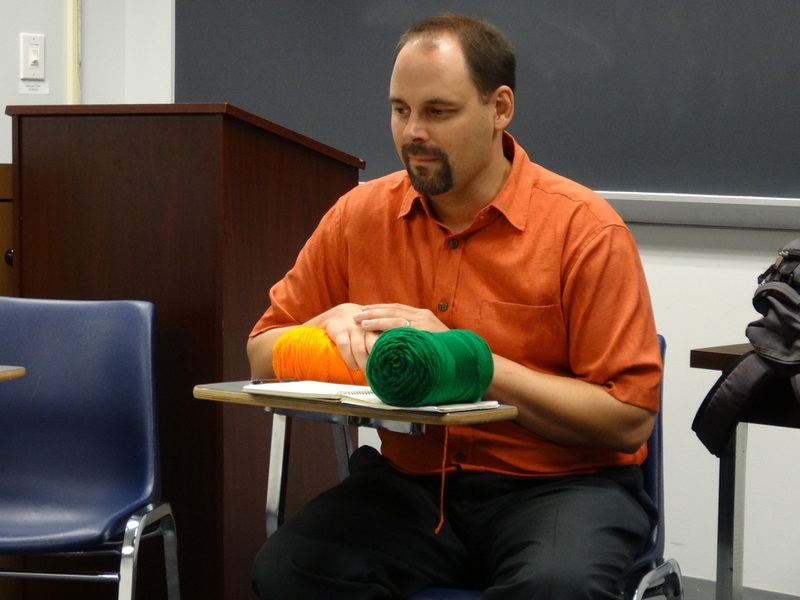 The session I attended was part of the 2014–15 Workshop for Pre-Tenure Religion Faculty at Colleges and Universities. This workshop series is geared toward pre-tenure faculty teaching classes in either religious studies or theology. But those in comparative philosophy who teach in a combined philosophy and religion department, who teach courses on Asian traditions for a religion department, or who teach courses that are cross-listed with a religion department, can check with the Wabash Center about their eligibility. Between the participants and the facilitators in the workshop I attended, four of us were specialists in Asian traditions--some with backgrounds in religious studies, some in philosophy, and some in philosophy of religion. As you might imagine, all of us had considerable overlap in the types of classes and course content that we teach at the undergraduate level. One of the best parts of the workshop, for me, was getting to learn about how colleagues in religious studies teach the material that I also cover in my philosophy classes. The workshop offered meetings on designing syllabi, developing assignments, assessing student work, and sharing teaching tactics. My time there was amazingly productive and rewarding, and I still have two upcoming sessions in 2015 to look forward to. I hope this brief blog post will encourage others in the STCP community to consider the teaching resources available through the Wabash Center. You can learn more about the workshops they offer here, as well as grants here. 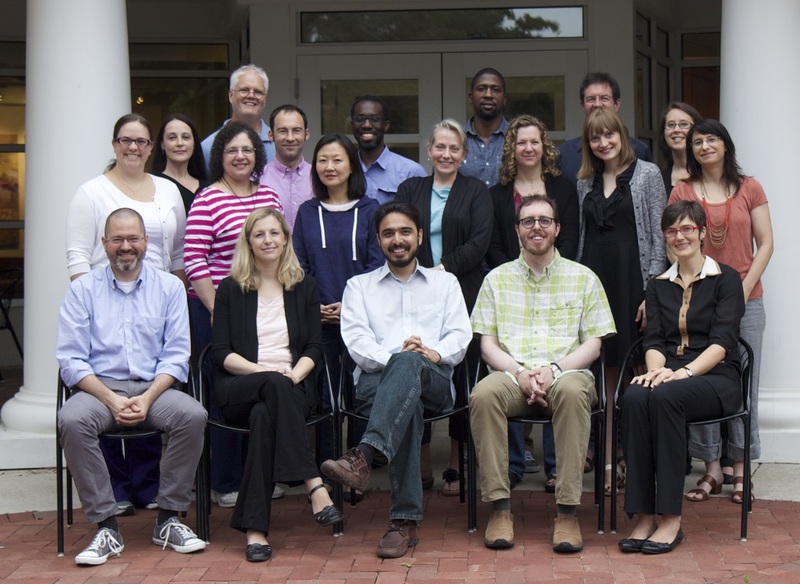 Participants and facilitators from the 2014 summer session. It was an amazing experience--Thanks Wabash! 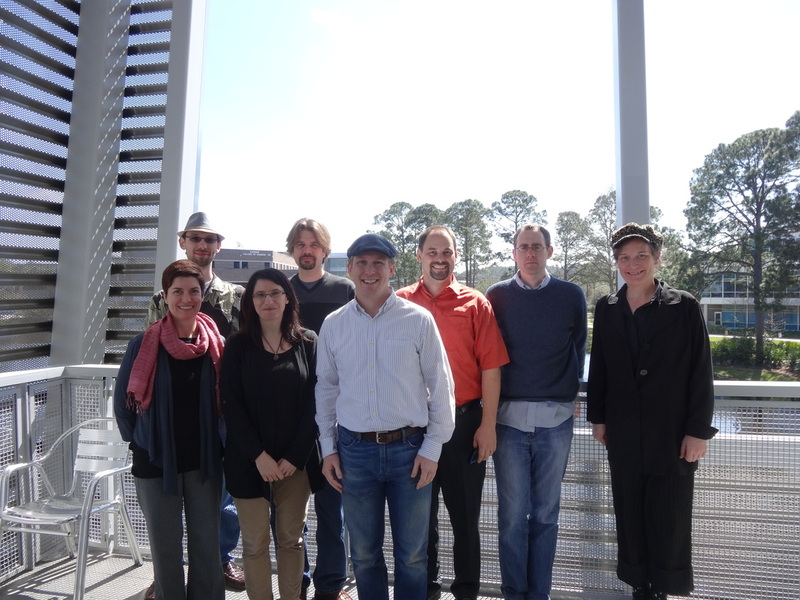 We had an enriching, informative, productive, and fun time at the STCP's inaugural meeting at the University of North Florida in Jacksonville, Feb. 28-March 1, 2014. It was so valuable to gather together with other teachers in the field of comparative philosophy, to share ideas, discuss common problems, and brainstorm with each other about possible strategies and solutions. I think we all came away feeling invigorated about our work as teachers and optimistic about implementing many new ideas in our classrooms. 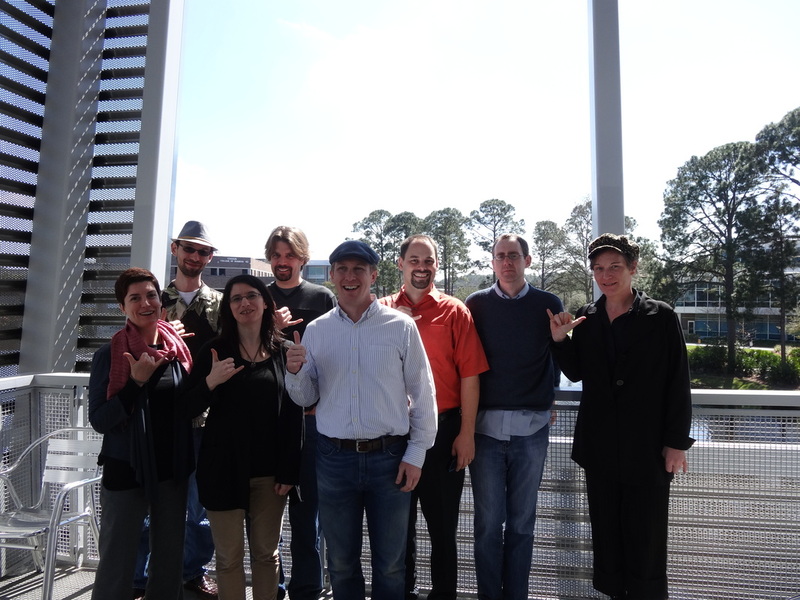 Back row: (left to right) Aaron Creller, Paul Carelli, Ben Lukey, Andy Lambert, Amy Donahue. Front row: Erin McCarthy, Leah Kalmanson, Jeremy Henkel. We began our first symposium panel with with a presentation by Jeremy Henkel (Wofford College), "Structuring Introductory Comparative Philosophy Courses: Around Topics or Traditions?" Jeremy talked us through a persistent problem for comparative philosophy teachers--Do we organize our syllabi around topics (identity, metaphysics, etc.) or around traditions (Greek philosophy, Buddhism, African philosophy, etc). Too often our choices for topics are dominated by terms of discourse set by the Western canon. That said, our choices of traditions too often obscure the diversity that makes neat categories such as "Buddhism" questionable. Jeremy presented a variety of approaches to mediate these problems, centered on his ideas for organizing a new world philosophy textbook. Our morning symposium continued with Aaron Creller's (University of Hawai’i at Mānoa) "Introducing the World: Making Time for Islamic and Chinese Material Alongside the Western Canon." Aaron presented several well-designed course modules, designed to allow professors to easily slot sessions on Islamic or Chinese philosophy into introductory philosophy classes. Our next presentation was by Andrew Lambert (Western New England University) on "Integrating Chinese Thought and Debates in 'Western' Philosophy." Andy offered a range of creative solutions to one of the problems brought up in Jeremy's presentation, the issue of using topics from Western philosophy to organize all class material. Instead of using common themes from Western discourses (e.g., mind-body dualism, utilitarianism vs. deontology), Andy suggested a variety of organizational strategies on themes such as tradition, ritual, family, and guanxi 關係, which are rooted in the Chinese tradition but flexible and broad enough to organize a variety of philosophical material. Our final presentation by Paul Carelli (University of Northern Florida) provided strategies for "Teaching Ancient Greek Philosophy as a Non-Western Tradition." As Paul reminded us, classical Greek culture is in many ways as remote from us today as any one contemporary culture is from another. He offered strategies for reinvigorating our approach to teaching Socrates in the undergraduate classroom. After lunch, we continued with our first workshop, led by Erin McCarthy of St. Lawrence University, "Contemplative Pedagogies For Comparative Philosophy: A Hands-on Workshop." Erin provided an inspiring and thought-provoking overview of contemplative education practices that help students engage in experiential learning, critical self-reflection, and close reading of texts. These include, for example, breathing and meditation exercises that help students calm their minds and concentrate in class; contemplative reading exercises that can be used in class to foster deeper engagement with texts; and mindful listening exercises that help students process information together and reflect on what they've learned. We reconvened on Saturday with our second symposium session, which started with Amy Donahue's (Kennesaw State University) "Sidestepping Colonialist Pitfalls in Comparative Philosophy Classes." Amy walked us through material by the Subaltern Studies Group that questions the Eurocentrism of historical narratives and the construction of so-called classical periods across world cultures. This deeply problematizes the role of comparative philosophy teachers in transmitting these histories and "classical" texts to students. Amy discussed with us constructive approaches to dealing with these issues. 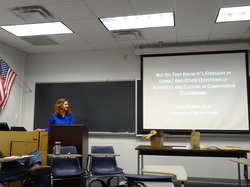 We continued with Sarah Mattice (University of North Florida), "But Do They Know It's February in China? And Other Questions of Authority and Culture in the Comparative Classroom." Sarah helped us look at the difficult position that comparative philosophy teachers sometimes find themselves in, i.e., occupying the role of cultural representative for a variety of cultures and traditions. Sarah organized her talk around various questions students have asked her, each of which help problematize students' assumptions as well as teachers' responsibilities. The last talk was my own "What's in a Name? Contextualizing the Colonial History of Comparative Philosophy for Students." Much like Amy, I raised issues of Eurocentrism in the portrayal of histories, cultures, and traditions. And much like Andy, I wanted to think through alternative categories for organizing class material. Ben preparing yarn for our p4c community ball. Our second workshop was by Ben Lukey of the Uehiro Academy for Philosophy and Ethics in Education on the topic "The Activity of Philosophy: What 'Philosophy' for Children Can Offer Comparative Philosophy." Ben helped us think deeply about our approach to the philosophy classroom and our goals for student learning. He gave us strategies from the pedagogy known as"philosophy for children" or p4c, which help build community, foster students' sense of intellectual safety in the classroom, and allow for student-directed discussion and exploration. We were fortunate to conclude our inaugural meeting with a second session led by Erin McCarthy, focused on mindfulness strategies that teachers can use to manage stress and promote wellbeing while seeking to maintain a healthy work-life balance within academia. Our meeting was punctuated by several great meals at local restaurants and ample time for conversation and sharing. For making the first STCP meeting possible, we would like to thank the Florida Blue Center for Ethics at the University of North Florida, the UNF Asia Council, the Drake University Center for the Humanities, and Drake's Office of the Provost. We are already looking forwarding to planning the 2015 gathering. In the meantime, we'll soon be posting materials from the first meeting to the website, as well as building the content under Resources for Teachers. Blog post by Leah Kalmanson (Drake University).